We have received many requests for installation instructions and a list of parts required to install lower side mouldings on Model 43, 46 and 46S jobs, not originally equipped with the mouldings. Locate reference point ”A” on the front fender as shown in Figure 44. A flexible steel rule is used for measuring the 12 7/16″ dimension. Locate reference point “B” on the rear fender as shown in Figure 45. Using a chalked cord, make a reference line as shown in Figure 46. Using the dimensions given in Figures 47 and 48, prick punch each hole location. Drill all holes with a 1/8″ diameter drill. Next redrill all holes with a 11/32″ diameter drill except the 7/32″ and the 1/8″ diameter holes as shown in Figure 48. NOTE: Step # 6 must be completed first, or possible damage to the paint and sheet metal will result. Install the moulding clips, shown in Figure 49, in the mouldings as shown in Figures 47 and 48. With the front door open install the door mouldings. File the front fender to clear the door mouldings. Install the remaining mouldings. NOTE: The gravel shield in the front half of the rear fender on the two door models must be removed in order to install the holding nuts. Line up mouldings by tapping them into place. To tap the mouldings into alignment, first place a small wooden block on the moulding and gently tap the block with a hammer. Replace the door trim pads. 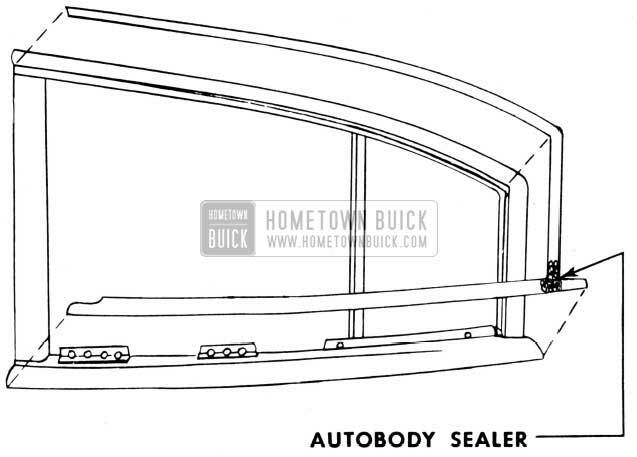 In order to improve weather sealing, new sealing and weather stripping operations were used around doors and along the side roof rail sections of late production 1949 Series 70 Riviera Models. 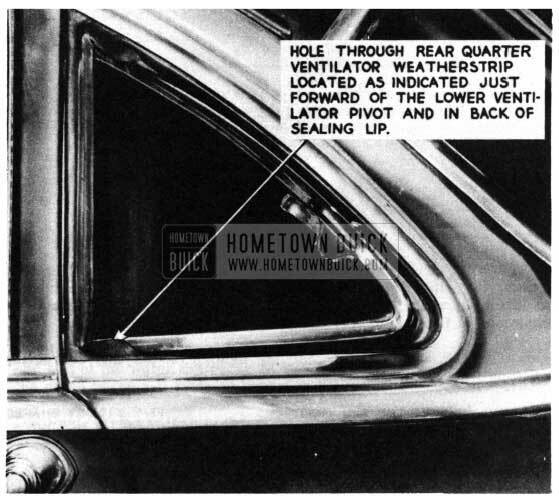 In addition, new chromium plated sealing strips were incorporated over the rear quarter window sections. These improved weather sealing operations can be used on earlier production jobs, if necessary, by following the procedures outlined later in this article. 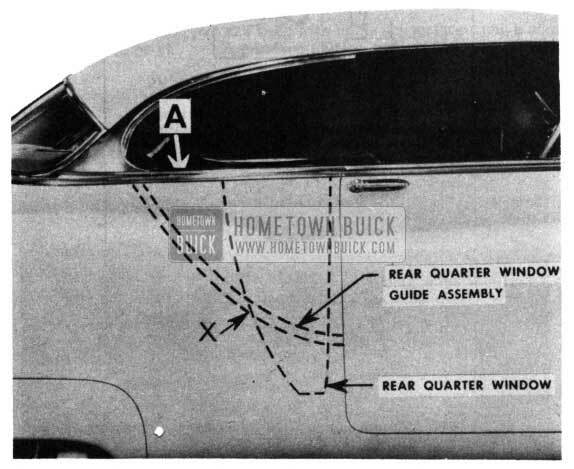 Check the operation of rear quarter windows and adjust to eliminate any looseness, or excessive friction as explained on Page 26 of the 1949 Special Sport Coupe Body Manual. 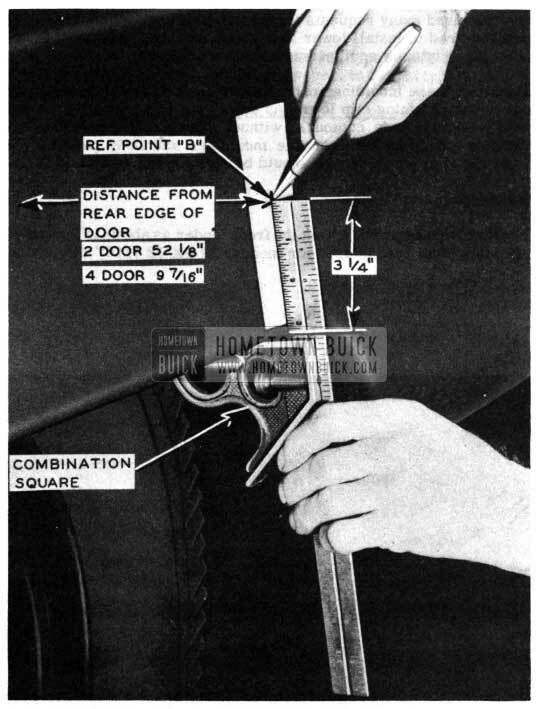 If necessary, carefully trim the upper end of the rear quarter window weatherstrip located on the forward edge of the rear quarter window to fit the side roof rail weatherstrip as noted in Figure 50. Seal between the glass and frame with 3M Autobody Sealer, if the glass channel filler is torn or short, as noted in Figure 50. Between the inside surface of metal and the outer surface of deflector. At lower rear corner of the deflector opening. Apply waterproof tape or cement sections of imitation leather at the locations noted below. Use 3M Weatherstrip Cement for cementing operations. Over the two access holes at bottom of door. Over the two access holes in the deflector. To install and properly seal the rear quarter window sealing strips, first remove the side roof rail weather strips, weatherstrip retainers, side roof rail lower molding assembly, and weatherstrip retainer gaskets. Removal procedure is the same as on convertible styles. 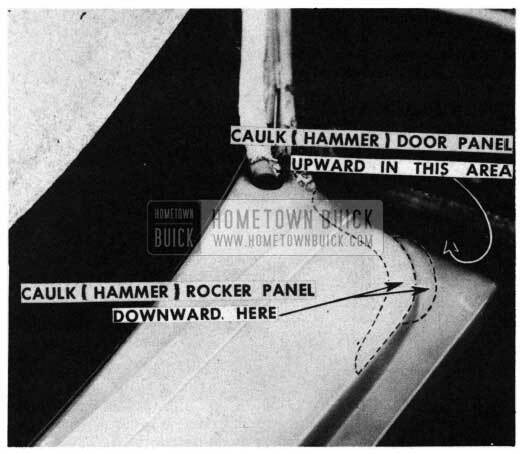 Caulk down any high spots on the bottom surfaces of the side roof rails if necessary as indicated in View “B”. Cement the side roof rail weatherstrip retainer gaskets to the roof rails with 3M Weatherstrip Cement. Position the new rear quarter window sealing strips on the roof rails over the rear quarter windows so the forward edges clear the door window glass frames. 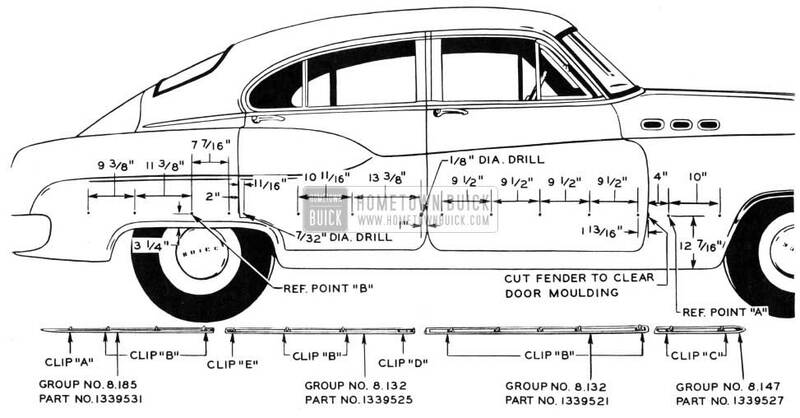 Then, trim the rear ends so they fit the top of the 1950 Buick body reveal molding as shown in View “D”. Apply continuous beads of 3M Autobody Sealer to top surfaces of the sealing strip attaching flanges and weatherstrip retainers and bottom surface of weatherstrip gasket as shown in View “B”. Attach the side roof rail lower molding assembly, sealing strips, and weatherstrip retainers to the side roof rail as shown in Views “B” and “C”. NOTE: A hole must be drilled in the side roof rail and weatherstrip retainer and a new screw used at the forward end of the new sealing strip. This can be done prior to Step #6, using the hole in the for­ ward tab of the sealing strip as a guide. 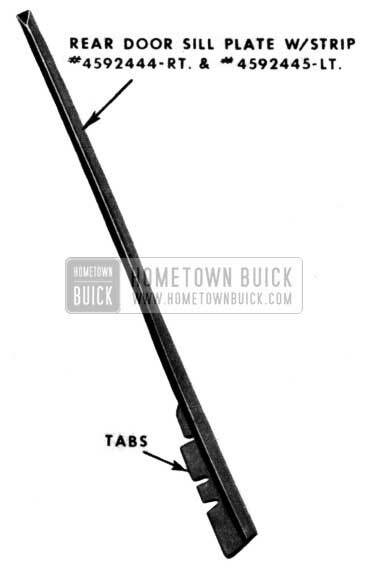 Carefully raise the rear quarter window and adjust the sealing strip inward or outward so that a light brushing contact is obtained between the rear quarter window frame and the “pile” of the sealing strip. Install the side roof rail weatherstrip in the retainer, giving special attention to the fit at the front end where it meets the windshield pillar weatherstrip as indicated in View “E”. Cement a 1″ section of 3/8″ diameter sponge rubber between the weatherstrip lip and sealing strip with 3M Weatherstrip Cement as shown in View “C”. The forward end of the sponge rubber should be “flush” with the forward end of the sealing strip. Seal between sealing strip and side roof rail with 3M Body Caulking Compound as shown in View “C”. Seal should be applied along en­ tire length of sealing strip. Apply 3M Body Caulking Compound as shown in View “A” to seal notch at roof panel in front corner of drip molding. Apply 3M Body Caulking Compound at forward end of side roof rail retainer as shown in View “E”. Apply pyroxylin glazing putty in roof panel to drip molding joint, as shown in View “C”. After the installation of the rear quarter sealing strips, the following operations should be performed. Some of these operations are de­ scribed and illustrated in the 1949 Service and Construction Manual for the Special Sport Coupe models and, to assist in the field operation reference will be made to the Manual. 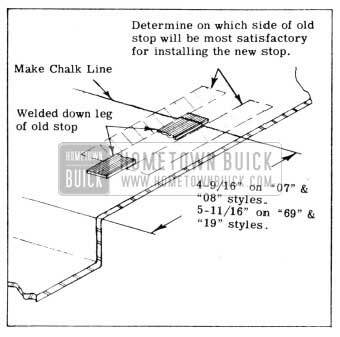 Adjust the door ventilator and door glass as outlined on Pages 37 and 38 of the 1950 Buick Body Manual. U the above operation does not provide sufficient downward adjustment, the entire door can be lowered on the hinges, as outlined under “Adjustment of Doors” on Page 41 of the Manual. NOTE: Do not replace the door trim pad at this time if it has been removed. Check the door hinge and lock pillar weather strips, recementing any loose sections. 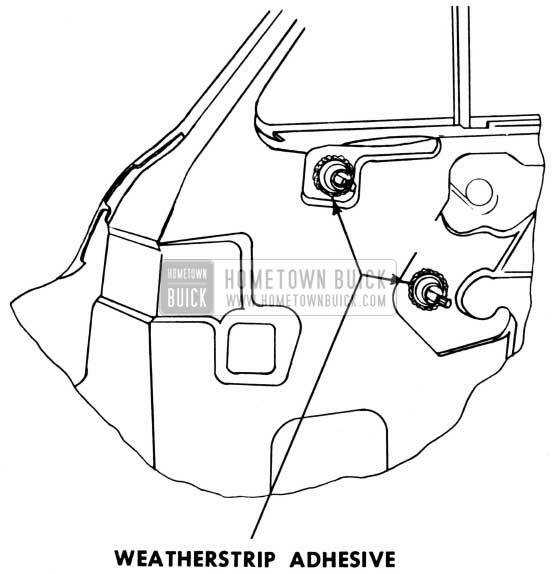 When necessary, make up and cement a rubber shim between the door and weatherstrip, as shown in Figure 53, to obtain a satisfactory seal between the door weatherstrip and front body hinge pillar at the creaseline section. This same method of shimming can also be used at the creaseline on the lock pillar side of the door, when necessary. NOTE: Use 3M Weatherstrip Cement in all of the above operations. 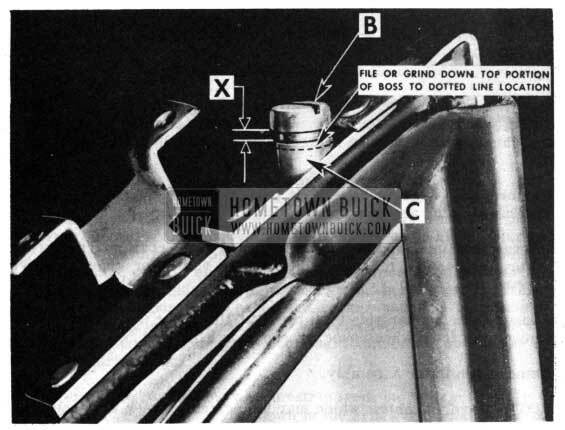 Grind back the door flange at the top of the hinge pillar sufficiently to permit the door hinge pillar weatherstrip to effect a sealing con­ tact with the 1950 Buick body hinge pillar. The metal should then be repainted in the rework area. Seal the joints between the ventilator division post and lower ventilator weather strips, as indicated, using 3M Autobody Sealer. Seal under the lip of the ventilator weatherstrip with 3M Weatherstrip Cement as shown in Figure 53. Cement a piece of sponge rubber inside the ventilator division posts, as illustrated in Figure 54, using 3M Weatherstrip Cement. 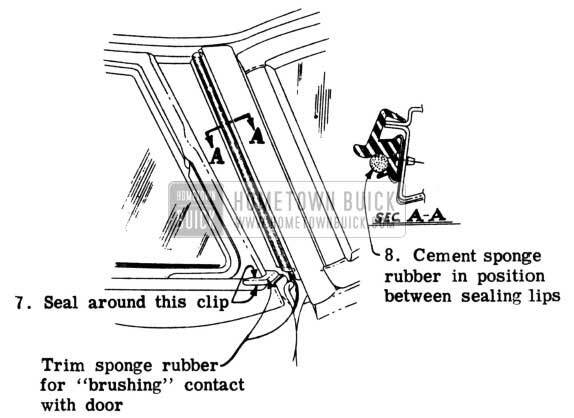 Seal the joints around the ventilator weatherstrip retaining clip with 3M Body Caulking Compound as shown in Figure 55. Cement a 3/8 diameter section of sponge rubber filler sixteen (16) inches long between the sealing lips of the windshield pillar weather­ strip, as shown, using 3M Weatherstrip Cement. In case water is trapped inside the door by the door bottom weatherstrip, notches should be cut in the sealing lip at the door drain slots, as indicated in Figure 56. The edges of the cut should be coated with 3M Weatherstrip Cement to prevent the rubber from soaking up water. Check the doors for water leaks at the inner panel and, when necessary, seal as specified on Page 68 of this bulletin. If necessary, caulk the top of the door lock pillar forward to gain necessary clearance for the proper sealing contact of the weatherstrip at this location. Caution should be exercised so that operation of the door glass is not affected. 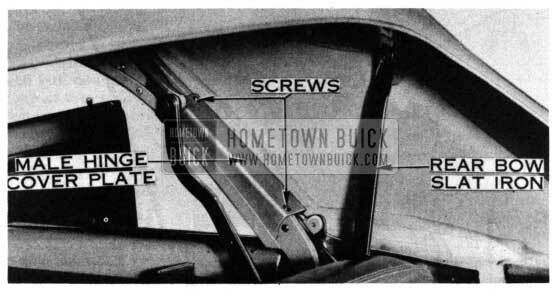 If a case is encountered where the front seat cushion stabilizer wires have slipped through their retaining clips and have punctured the cushion side trim, they may be refastened as outlined in the following procedure. Remove front seat assembly from 1950 Buick body and place upside down on a clean bench. 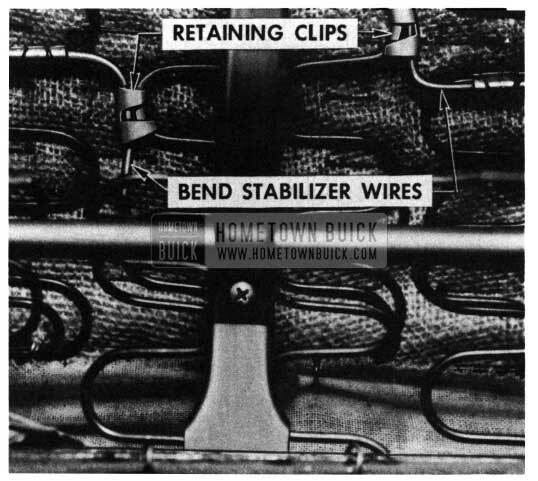 Slide stabilizer wires “A”, as shown in Figure 57, through any clips from which they may have become disengaged. Carefully remove clips “B” from the inner end of each stabilizer wire. Bend the inner end of each wire and refasten to the zig-zag spring as shown in Figure 58, with the same clip removed in Step # 3. NOTE: The assembly illustrated is the solid back style. Split back styles may be reworked similarly although the center support “C” is wider than that shown in the illustration. Clinch all remaining clips on stabilizer wires to provide proper retention. Repair or replace trim as required. A satisfactory method of treating front door lock cylinders to reduce the effect of freezing conditions has been developed. The treatment is comprised of a paraffin and carbon-tetrachloride mixture applied according to the following procedure. The paraffin treatment is effective, however, only on second type push button lock cylinders such as illustrated in other procedure. These are identified by a swinging shutter and rectangular slot. Dry out the lock cylinder by directing a stream of compressed air into the push button and by focusing a heat lamp on the handle for approximately 10 minutes. Do not heat panel to the extent the heat will damage the paint. Make up a solution of 1 part melted paraffin (stocked in most grocery stores) and 19 parts carbon tetrachloride in an amount just sufficient to fill a gun-type oiler. CAUTION: Fumes of carbon tetrachloride should not be breathed. The carbon tetrachloride dissolves the paraffin and evaporates after application, leaving a thin film of paraffin on all wetted surfaces. A gun-type oiler can be used for applying the solution. Apply the solution around the edge of the lock cylinder face as shown in Figure 59. Press the gun nozzle against lock cylinder face to allow flow of solution between cylinder and push-button cap. DO NOT GET SOLUTION IN THE KEY OPENING. Depress the push button part way and apply the solution around the button-to-handle joint as shown in Figure 60. Clean off any excess solution from the handle assembly. To insure complete evaporation of the carbon tetrachloride inside the handle assembly, reheat the handle with the heat lamp or blow a stream of compressed air into the push button. Series 40 First Jobs Up to Serial Nos. * Paint formulas revised with accompanying change in combination number. In addition, the combinations listed above for Series 40 after jobs are also applicable to 1950 Series 50 and 70 cars. The following colors are available on Models 56C and 76C only. The following combination is available only on Model 56R at extra cost and models 75R and 76R at no extra cost. To improve the retention at the outer molded ends of the windshield header weatherstrip, Group 14.060Part No. 4594737, the weatherstrip is now to be installed underneath the front body hinge pillar pinchweld finishing molding after the molding has been reworked by trimming the upper end. Remove the front body hinge pillar pinchweld finishing moldings from each side. Cement outer molded caps of weatherstrip to windshield pillar. Both right and left caps should be fitted before the center portion of weather strip is fitted to flange on header. After positioning and cementing the molded end caps, cement and fit the center portion of the weatherstrip to the windshield header. Trim off the upper end of the front body hinge pillar pinchweld finishing molding as shown in Figure 61. Both the first type and the second type moldings are shown to illustrate the different hole positions. The trimming operation is the same for both types. Apply a bead of 3M Autobody Sealer to the pillar in the location as shown in Figure 62. 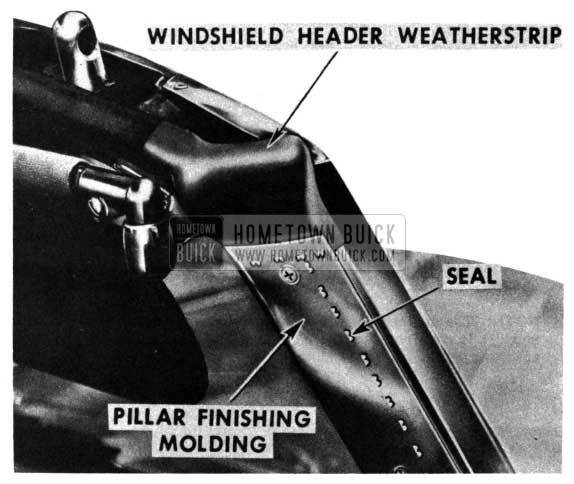 Install the finishing molding to the 1950 Buick body with the upper end lapped over the windshield header weatherstrip as shown. To complete the operation, position and install the weatherstrip retaining plate on the windshield header . A service method for stiffening the front seat cushion and back springs on 1950 models has been developed to provide additional support for owners of abnormal weight. A service package, Front Seat Cushion and Back Helical Tie Wire, Group 11.419, Part No. 13905419 has been prepared for this operation. Remove the front seat from the 1950 Buick body. 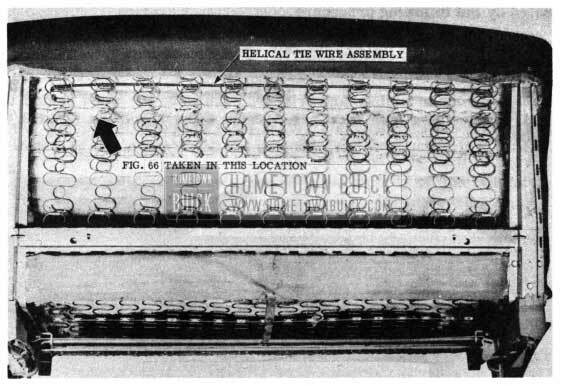 Position and clip the helical tie wire assemblies “A” and “B” to the zig-zag spring units so the¥ attach to the same line of loops that the “end assembly helical tie wires” are clipped to as shown and noted in Figure 63. Position and clip the helical tie wire “C” to the zig-zag spring as shown. NOTE: The stiffness of the seat should then be checked and if more support is required, additional helical tie wires can be clipped to adjacent loops of the spring units. Remove the front seat assembly from car. Remove the front seat back panel. Position and clip the helical tie wire to the loops of the zig-zag spring units and attach with a hog ring as shown. This operation should be performed at both ends of the helical tie wire to prevent end movement of the tie wire assembly. NOTE : If more support is desired in the seat back assembly, additional tie wire assemblies can be clipped to adjacent loops of the zig-zag spring units. 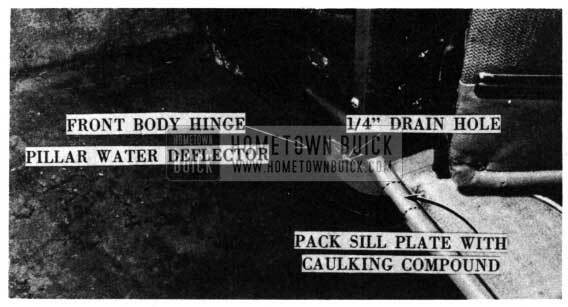 Tail Gate brace rattles on 1950 Estate Wagons can be reduced or eliminated by the following procedure. Drill 1/4″ holes through the gate and rear floor mouldings at each side (total of 4 holes) at locations shown in Figures 67 and 68. Remove the mouldings and drill 3/8″ holes in the wood behind the 1/4″ moulding hole locations. These holes should be about 3/8″ deep. Reinstall the mouldings and insert Group 10.587, Part No. 4115282 rubber bumpers in the 1/4″ holes. Install 2 Group 10.587, Part No. 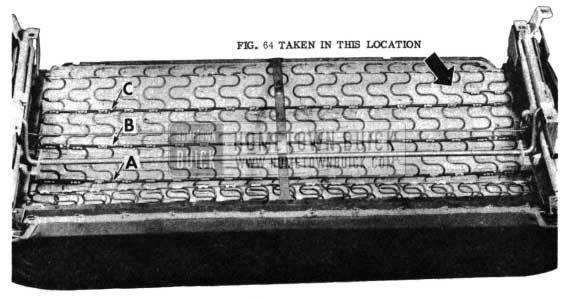 4076899 bumpers as shown in Figure 68. The inside top corner of the bumpers should be flush with the top of the rear compartment floor. 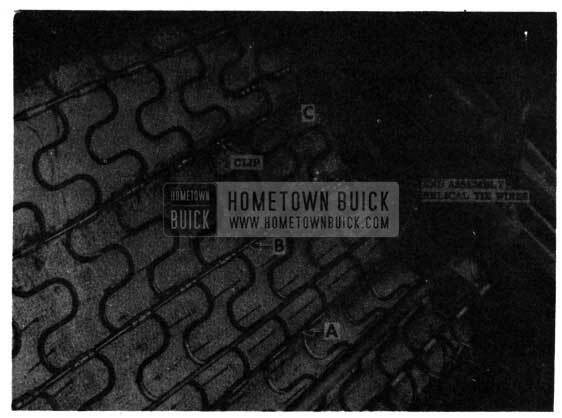 Cut 2 additional bumpers from 1/8″ x 1/2″ sponge rubber strip and install on the inside of the tail gate side frames as shown in Figure 67. Tighten all bolts and screws in, and in the vicinity of, the tail gate. If trouble is encountered with waterleaks around the tail gate seal a late production type seal should be installed. This seal can be obtained from the Ionia Manufacturing Company, Ionia, Michigan, under Part No. 80601. In those cases where the front body hinge pillar lower weatherstrip, Group 10.6949 Part Nos. 4592308 Right and 4592309 Left, has been torn or mutilated, the following installation procedure for the replacement weatherstrip should be followed. Remove the front door sill plate. Remove the damaged front body hinge pillar lower weatherstrip from the body and clean off all dried cements and sealing compounds from the rocker panel and body hinge pillar. 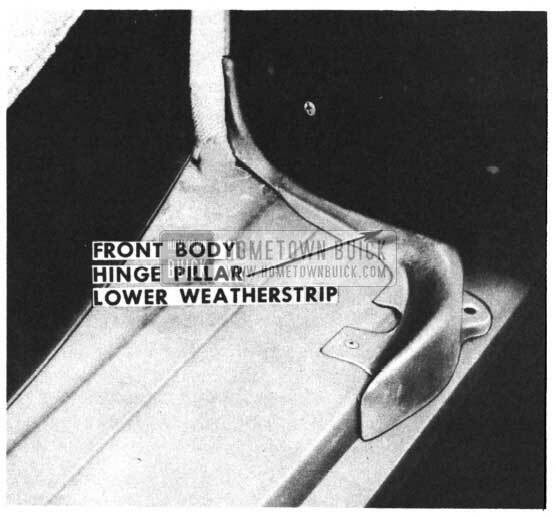 Position a new hinge pillar weatherstrip on the 1950 Buick body as shown in Figure 69. With a new weatherstrip in position, carefully open and close the door observing the amount of contact between the hinge pillar weatherstrip sealing lip and the bottom surface of the door inner panel. A brushing contact should be obtained between the door inner panel surface and the hinge pillar weatherstrip. 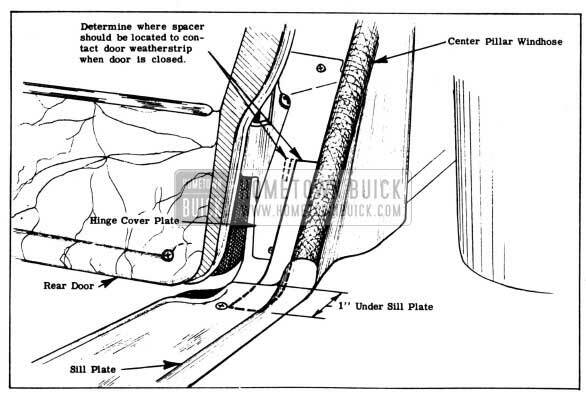 In the event the clearance between the door inner panel and rocker panel is insufficient and would result in damage to the new weatherstrip, the following rocker panel and door bottom panel caulking (hammering) operations should be performed. 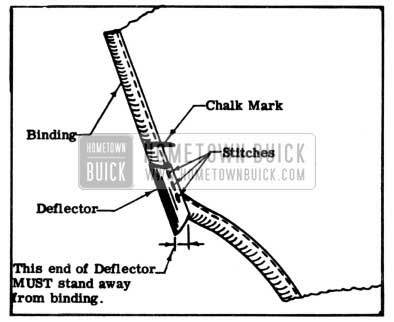 After removing the new weatherstrip from the 1950 Buick body, carefully caulk (hammer) the rocker panel down in the areas indicated by the dotted lines in Figure 70, to obtain the necessary clearance for the hinge pillar weatherstrip. 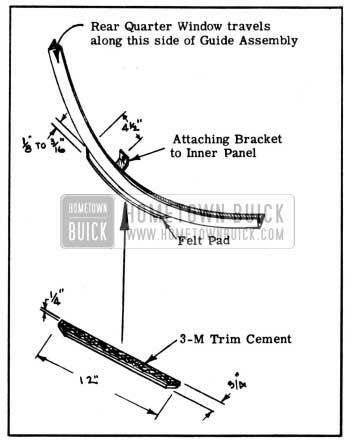 Reinstall the hinge pillar weatherstrip to the 1950 Buick body using 3M Weatherstrip cement and the attaching screws. 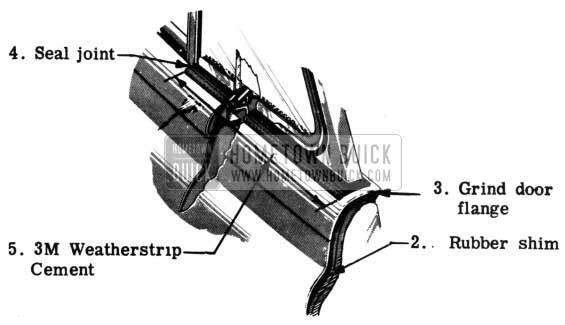 Re-check contact of weatherstrip with door bottom and if additional clearance is still required it can be obtained, without removing the weatherstrip, by caulking (hammering) the door panel slightly upward. Apply 3M Auto Body sealer to the rocker panel and re-install the door sill plate. Remove rear seat cushion, seat back and rear quarter ventilator garnish molding assembly. Loosen headlining and boarded trim panel over rear quarter ventilator sufficiently to gain access to the ventilator upper support screws. Loosen rear quarter side trim panel at the upper rear corner and swing away from wheelhouse, as shown in Figure 71. 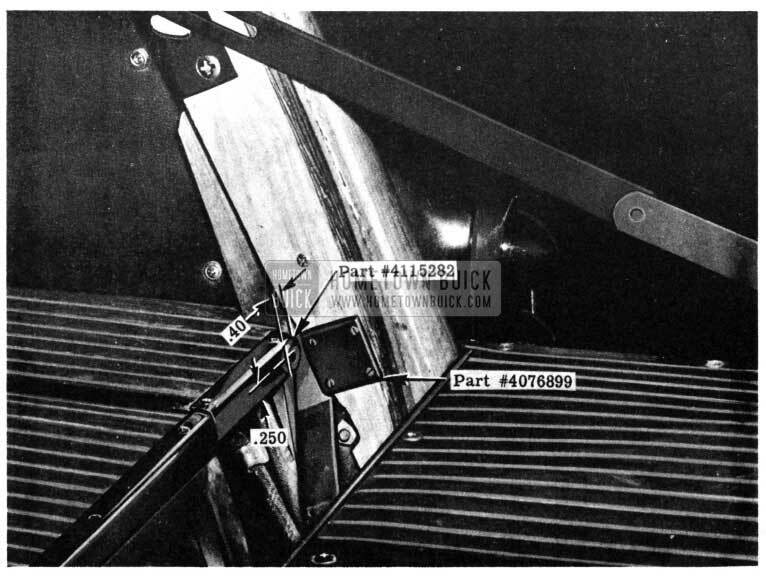 NOTE: Save any shims which may be located between the ventilator upper support and the inner side roof rail extension, as shown at “A” in Figure 71. Tighten upper pivot stud ”B” securely against pivot support boss “C”, as shown in Figure 72. While applying hand pressure laterally against the ventilator window, slowly back off upper pivot stud from the support until the point of disengagement of the ventilator is reached. Then measure distance “X” shown in Figure 72. If dimension “X” is less than 1/8″ the upper pivot support boss ”C” must be filed or ground down 1/16″ to provide additional engagement, as indicated by dotted line on support boss “C” in Figure 72. NOTE: Do not cut into the base portion of the pivot support. 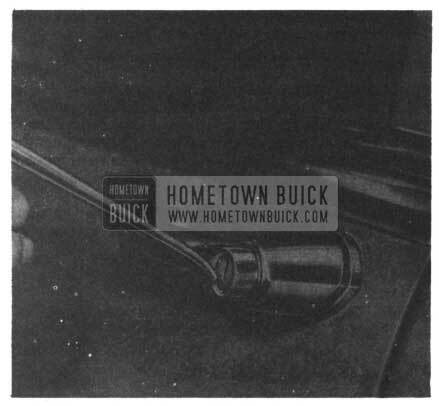 Install ventilator assembly in 1950 Buick body. The shims which were indicated at “A” in Figure 71 should be replaced. If there are no shims at this location, install a 1/16″ waterproof cardboard shim at each support. Cement outer lip of ventilator weatherstrip to the reveal molding with 3M Weatherstrip Adhesive. Refasten loosened trim; install garnish molding assembly, seatback, and seat cushion. Chalk-mark the top material side binding at the reveal line where the binding enters the rear quarter window gutter. Raise folding top to half-open position and pull bound edge of top material up from folding top compartment, as shown in Figure 73. NOTE: It is not necessary to remove screws securing flap of top cover in folding top compartment. Secure a piece of enameled drill (fabric) and cut as indicated at View “A” in Figure 74. 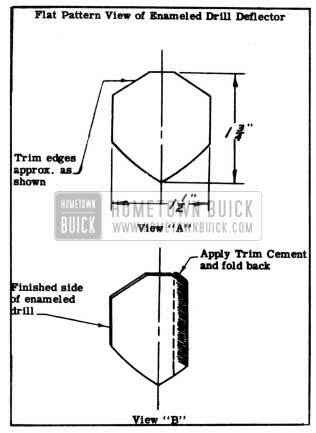 Apply trim cement to back surface of deflector and fold as shown at View “B” in Figure 74. Cement piece to top material side binding and stitch as shown in Figure 75. Lower end of deflector MUST stand away from binding. NOTE: Keep top edge of deflector below chalk line on side binding so that reworked area will not be visible when top is up. Operate top and observe folding action of reworked area of binding. 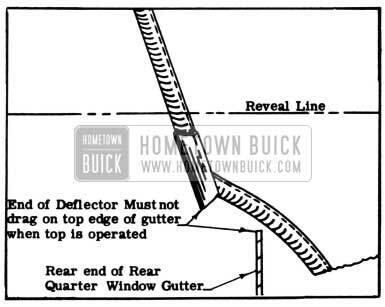 Deflector may be trimmed to provide proper clearance with top edge of rear quarter window gutter as noted in Figure 76. 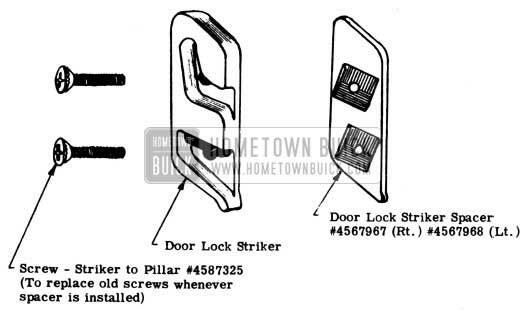 It is imperative that the proper method of door lock striker plate adjustment be used in order to obtain a satisfactory door closing condition. 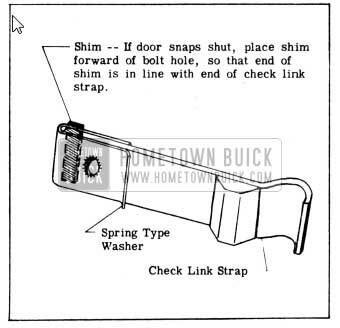 Therefore 9 we wish to review the striker plate adjustment features and the recommended adjustment procedure given in the 1950 Fisher Body Preliminary Series 40 Service Manual. 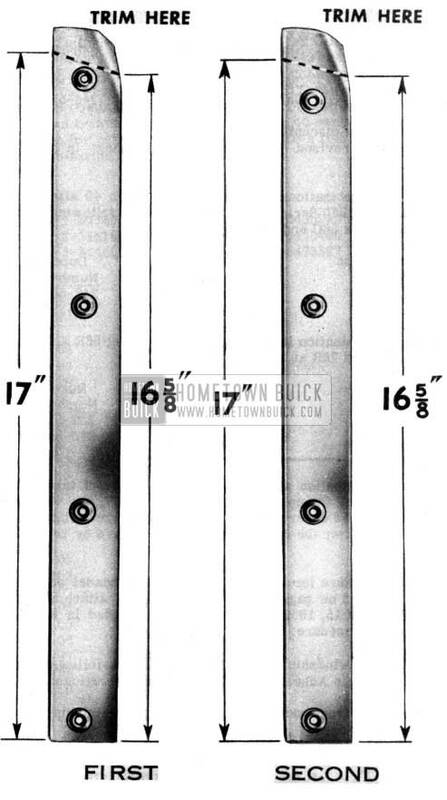 Adjustment is provided by means of floating anchor plates in retaining cages behind the 1950 Buick body lock pillar and center pillar facings. Serrations on the striker plates and anchor plates provide ample retention to hold the striker plates in the desired position. 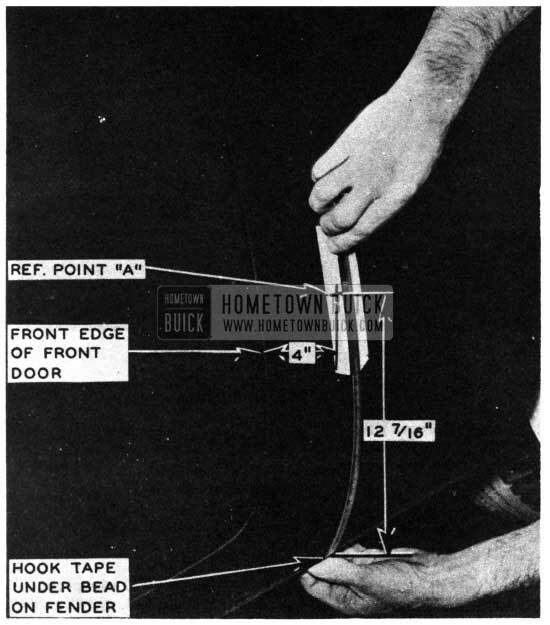 To adjust a striker plate, the attaching screws should be loosened sufficiently to allow the striker plate to be moved by hand to the desired location. Scribing the position of the striker plate on the pillar with a pencil prior to loosening the attaching screws will clearly indicate the amount the striker plate has been moved. Hammering or blocking a striker plate should never be attempted. Damage to the serrations results and proper retention is usually lost. Likewise, if the pillar facings are distorted during the hammering or blocking procedure, the striker plate will not have the proper base surface, and a tilted striker plate with improper operation of the lock will result. Directing a hammer blow or blocking the lift type lock bolt striker plates usually results in the closing of the lock bolt groove and the operation of the lock is then seriously affected due to a binding condition which develops on the lock bolt roller. Remove front seat from 1950 Buick body. Loosen rear floor carpet from foot rest panel and roll it back out of the way. Remove the foot rest panel (or panels) if necessary, to gain access to the seat adjuster support. Loosen the hydraulic seat adjuster from the support. If the support is loose, locate it in its original position and drill a 5/16″ hole through both legs of the support, through the floor pan and through the floor pan cross bar (which is welded to the underside of the floor pan). Locate the bolt holes as dimensioned in Figure 77. 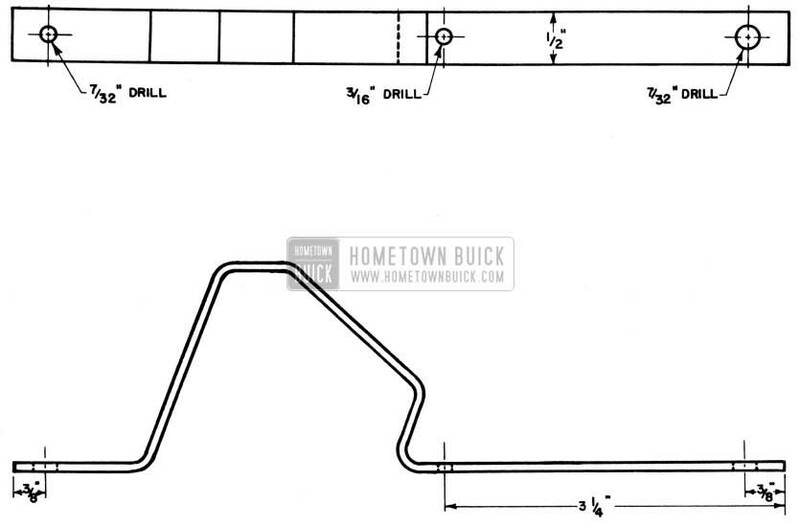 Install two 1/4″ hex-head bolts 3″ long as shown in Figure 77. Use lock washers with the nuts on the underside of the 1950 Buick body. NOTE: If the floor pan has been torn at the support location, it should be repaired by gas welding before bolting support in place. Obtain a 1-3/8″ x 1-5/8″ piece of 16 gauge sheet metal and make a flanged washer as shown in Figure 78. NOTE: This washer is used to improve the retention of the seat adjuster regulator and provide additional reinforcement for the leaf portion of the support to which the regulator is bolted. 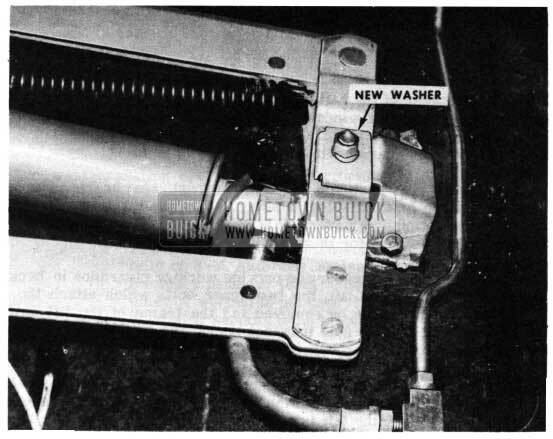 Install the seat adjuster regulator and replace present flat washer with the new flanged washer as shown in Figure 79. Install the foot rest panels and cement the rear floor carpet back in place, using 3M Trim Cement. 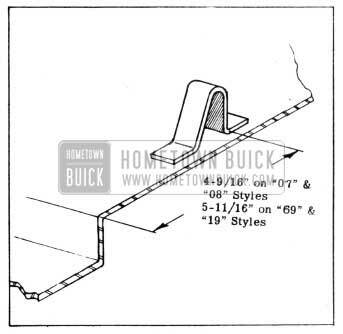 Install the front seat to the 1950 Buick body. 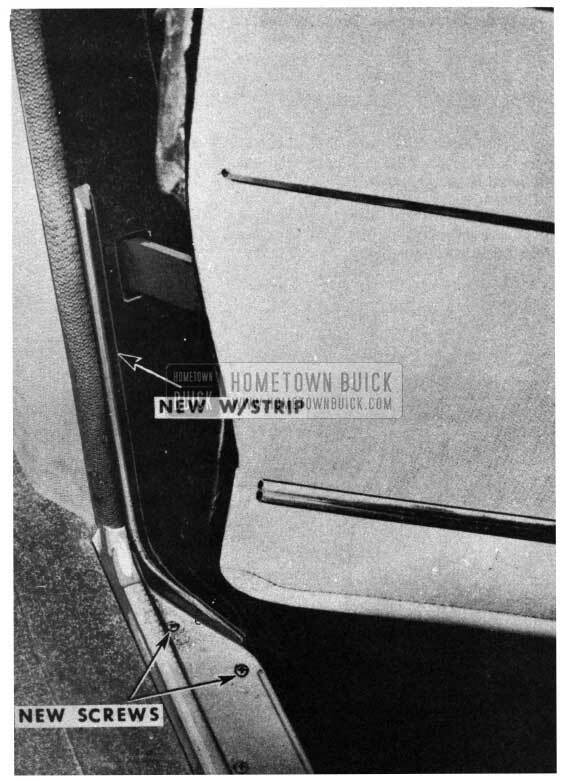 When checking complaints of rattles in the rear quarter area, when the window is down, on Riviera Coupe models, check to see if the chrome plated window frame is contacting the window guide assembly. This is easily done by lowering the window and looking between the inner and outer panels through the window opening (arrow “A” in Figure 80) while wiggling the window. Raise the rear quarter window to the full up position. Remove the rear seat cushion, rear seat back, rear quarter arm rest, rear quarter belt finishing molding, rear quarter trim, and inner panel inspection hole cover. NOTE: The guide assembly does NOT have to be removed for this installation. If more space is necessary to provide working clearance in back of the hydraulic window lift, the two upper bolts which attach the lift to the inner panel can be removed and the frame of the lift shifted forward. We wish to note it is not necessary to remove the lower hydraulic lift attaching bolt to shift the frame forward. Reaching through the inspection hole, carefully clean off any lubricating grease that may be on the underside of the guide assembly in the area where the felt is to be installed. Obtain a piece of felt 1/4″ thick, 3/4″ wide, and 12″ long. 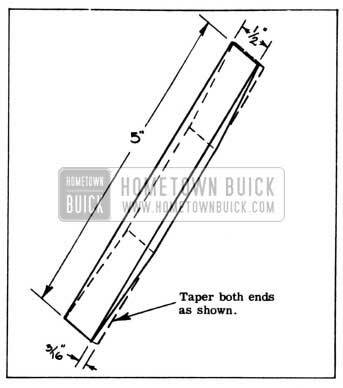 Taper both ends as shown in Figure 81. Apply 3M Trim Cement to the felt on the area which will contact the window guide assembly. Install the felt to the underside of the guide assembly in the approximate location shown in Figure 81. Carefully avoid getting any cement on the vertical flange of guide assembly. Allow the cement to dry at least an hour before lowering the window. On hydraulic styles, slide the hydraulic window lift assembly back and install the two upper attaching bolts. Seal and install the inspection hole cover, install the trim, arm rest, belt finishing molding, seat back, and seat .cushion. Figures 82 through 85 illustrate additional weather sealing operations, in door window and reveal molding areas, that have been incorporated in production on late bodies. 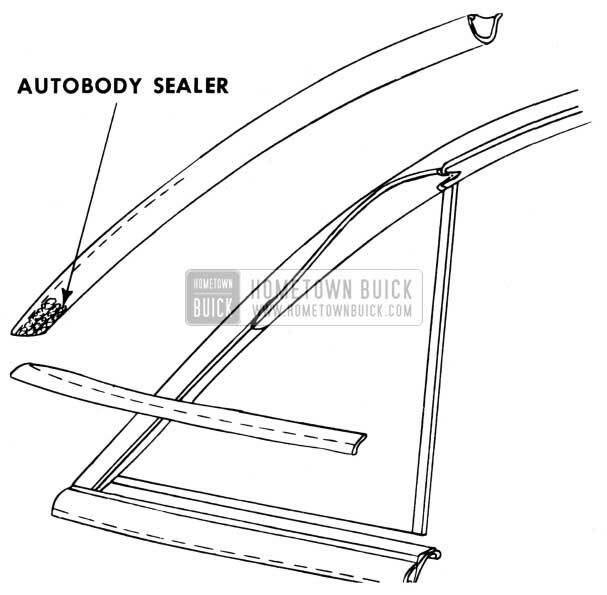 Figure 82 – Front Door Ventilator (All Closed Bodies) – Apply a bead of 3M Autobody Sealer along the upper edge of the inner panel to form a dam as shown. The sealer must be worked in between the inner panel and the rear ventilator support to be effective. Figure 83 – Front Door Window and Vent Regulator Spindle Hole Washer (All Models) – Brush 3M Weatherstrip Adhesive over the vent and window spindle hole sealing washers. Figure 84- Front Door Upper Reveal Molding (All Models except 52, 56R, 72R, 76R) – Apply 3M Autobody Sealer in the lower end of the molding. In some cases, damage to the front body hinge pillar sealing strip is confined to the portion of the strip above the upper hinge. To facilitate repairs of this nature a partial sealing strip, having the same pattern as the upper ten inches of the full size strip, has been released for service (See Figure 86). 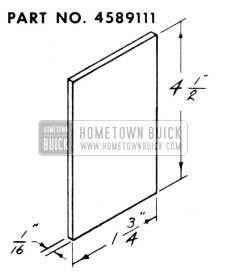 The partial strip is available from Buick Parts Warehouses as follows: Group 10.694, Part No. 4600065, Sealing Strip, Front Body Hinge Pillar ­ Upper Section. The rear compartment lid on 1950 Riviera Coupe Models is equipped with two ”torque rods” which are attached between the hinges and the 1950 Buick body. When the lid is lowered from an open position, these rear compartment lid torque rods in conjunction with the lid hinges develop a twisted tension or torque, which materially assists in raising and lowering the lid as well as holding it in the open position. The rear compartment lid torque rods can be removed and installed according to the procedure outlined below. CAUTION: Always brace the rear compartment lid before removing either or both of the torque rods, otherwise the lid will slam shut. U rattles should occur between the torque rods on some of the early production bodies, they can be eliminated by following the method described. Open the rear compartment lid and brace it safely before attempting any work on the torque rods. Remove the screw and clip “A” at each side of the rear compartment, shown in Figure 87. 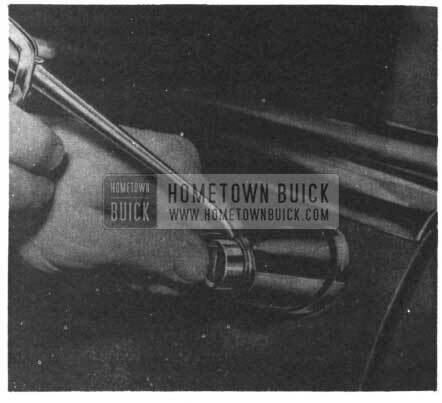 As shown in Figure 88, use a short length of pipe or any other suitable tool that will fit over the end of the torque rod “B” and lift the rod up and toward the center of the 1950 Buick body to clear the bracket ”C ”. After the end of the torque rod is free and below the bracket ”C”, the other end can be worked loose from the hinge by hand. Insert the torque rod into the hinge, using care to get it all the way up into the hinge cutout. Use the short length of pipe to get the torque rod back to its position on top of the bracket “C”. Install the clip and screw ”A”. Remove the brace and try closing the lid. If it does not close easily, the torque rods have not been inserted into the hinge cutouts properly. They can usually be shifted into the correct position without loosening or removing the rod. 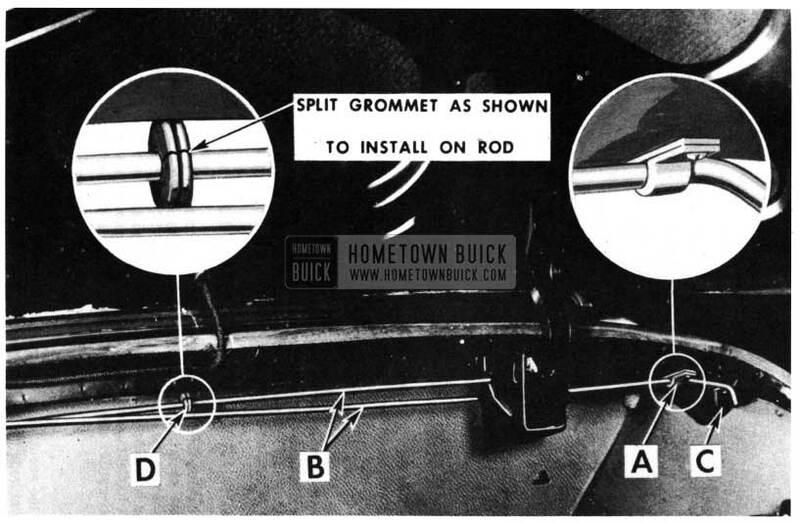 If rattles occur from the torque rods contacting each other or adjacent 1950 Buick body metal, they can be eliminated by placing a rubber grommet at center of the inner rod, indicated at “D” in Figure 87. The grommet can be split as shown on one side and slipped onto the torque rod with­ out loosening or removing the rod. 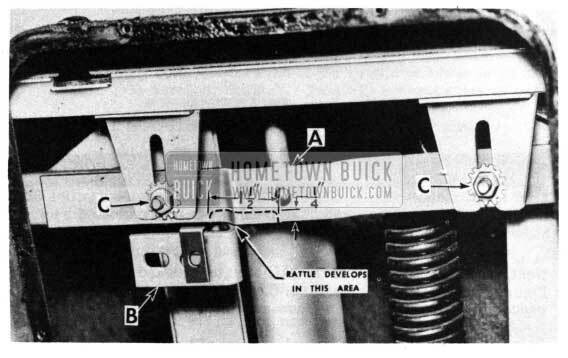 On later production bodies, a metal anti-rattler clip is welded to the 1950 Buick body in this location. 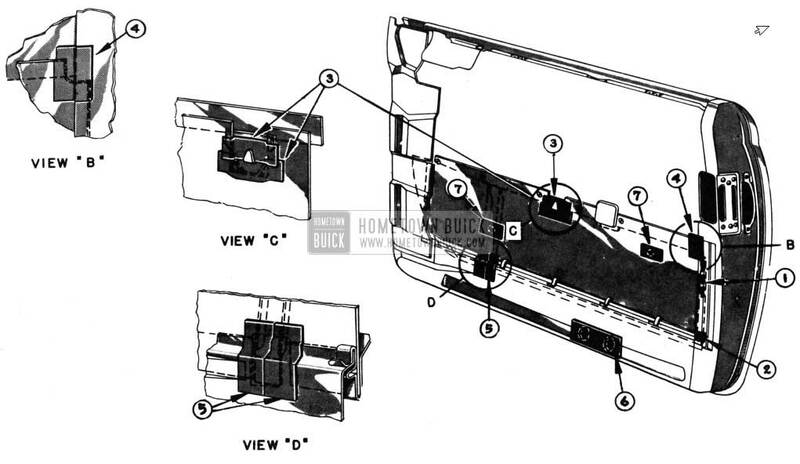 In the event water drains into the 1950 Buick body interior on the floor pan, from the front body hinge pillar area, a front body hinge pillar deflector, Group 10.694, Part No. 4600265 should be installed. This repair does not supersede those released for the front body hinge pillar sealing strip or door weatherstrips. The sealing strip and door weatherstrip repair operations should be performed, if they are required, before using the repair outlined in this procedure. Remove the door sill plate assembly and pack the front portion of the sill plate with 3M Caulking Compound as shown in Figure 89. Seal and reinstall the sill plate. Remove the cowl trim pad. Roll the floor mat back and trim the floor pan deadener at the base of the front body hinge pillar, as shown, to provide clearance for the water deflector. Clean off all old sealer from the floor pan in the area of the water deflector installation. Obtain a front body hinge pillar water deflector, Group 10.694, Part No. 4600265. Position and cement the deflector on the floor pan using 3M Weatherstrip Adhesive. One end of the deflector is cemented to the shroud panel reinforcement and the other to the sill plate as shown in Figure 89. 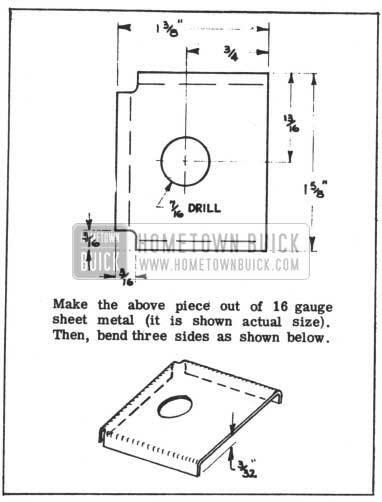 Drill a 1/4″ drain hole in the floor pan at the lowest point in this area as shown in Figure 89. Reinstall the cowl trim pad. Trim off the “jute” on the bottom of the floor mat in the water deflector area to prevent wicking. Remove the door sill plate assembly and pack the front portion of the sill plate with 3M Caulking Compound as shown in Figure 90. 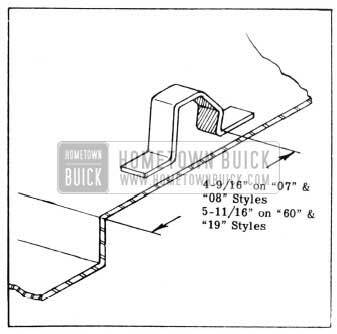 On 1950 Buick body styles for Convertibles and Rivieras, a sealing operation is required before installing the water deflector. 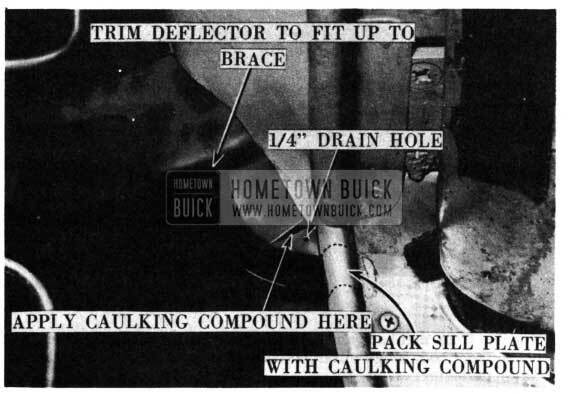 Apply 3M Caulking Compound into the space between the 1950 Buick body hinge pillar to floor pan brace and the floor pan as shown in Figure 90. The water deflector must also be trimmed to fit the hinge pillar to floor pan brace as shown in Figure 90. Position and cement the water deflector on the floor pan, also cement one end of the water deflector to the pillar to floor pan brace and the other to the sill plate as shown in Figure 90. Drill a 1/4″ drain hole in the floor pan at the lowest point in this area as shown in Figure 90. The following is the text of Special Service Letter – Dealer No. 80, dated January 6, 1950. For the past several years there has been a great deal of discussion pro and con as to whether or not it is advisable to Porcelainize new cars or to permit them to age 60 to 90 days before Porcelainizing. 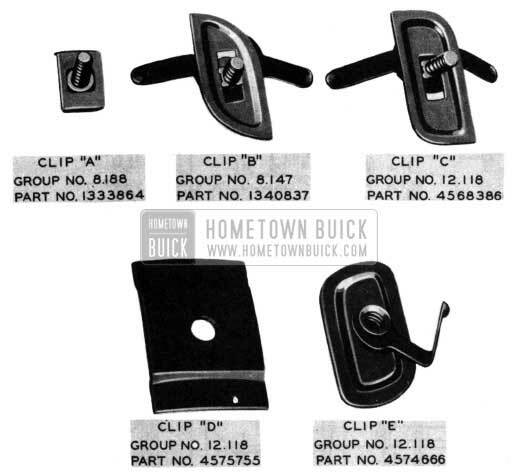 Proper equipment as recommended in various Buick Service Bulletins is used. The work is performed exactly as recommended by the manufacturer and is done only by trained workmen. That no cleaner of any type other than Buick Part #980830 be used. It is further recommended that all new cars be washed and the paint inspected before Porcelainizing and if defective paint is found, authorization for refinishing must be obtained from the Zone Office or a Buick Representative. Claims for “thin paint” or “rubbed thru” after porcelainizing will be refused because it is recognized that it is possible to damage paint through careless workmanship or by using the wrong type of cleaner. We trust that this bulletin will clear up any misunderstanding on Porcelainizing new cars. Lack of lubrication at kidney valve. Improper positioning of kidney valve tube. Items 1 and 2 can very easily be corrected in the dealerships without removing the wiper motor from the car. U the kidney valve tube is loose (item 3L a special staking tool is required to tighten it and we recommend in those instances that the wiper motor be replaced. Following are instructions for checking motors on car and correcting conditions 1 and 2. 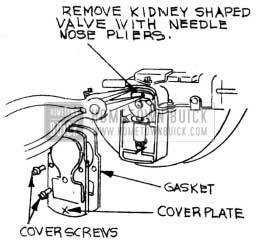 Remove valve cover and gasket and lift out kidney valve with needle nose pliers (Figure 91). Check distance that kidney valve tube protrudes from valve body as shown in Figure 92. This dimension should be 1/8″. If distance is greater, press tube into valve body to meet correct specification. U tube is loose and can be jiggled with your fingers after per­ forming Step #2, the wiper motor should be replaced. If tube is snug, wipe kidney valve surface, surface of valve body behind valve and valve cover free of lubricant or dirt accumulation. Apply thin coating of “Trico Wiper-Lube” (available from UMS Service Stations) to face of kidney valve that contacts the valve body. Replace valve, gasket and cover in reverse of Step #1. 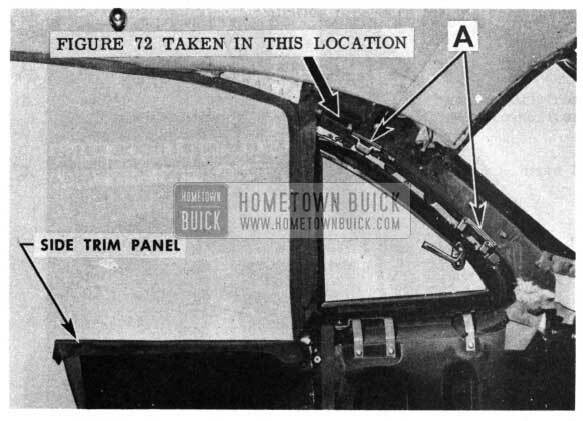 We have been advised that a potential leakage condition exists at the rear quarter window weatherstrips used on early production Model 52 and 72 Tourback sedans. On some of these cars an unnecessary hole was moulded through the rear quarter window weather strips just forward of the lower pivot location. Fill the small hole just forward of the ventilator lower pivot (Figure 7) with “3M Autobody Sealer”. This will prevent entry of water. This hole has been eliminated, in production on later jobs. 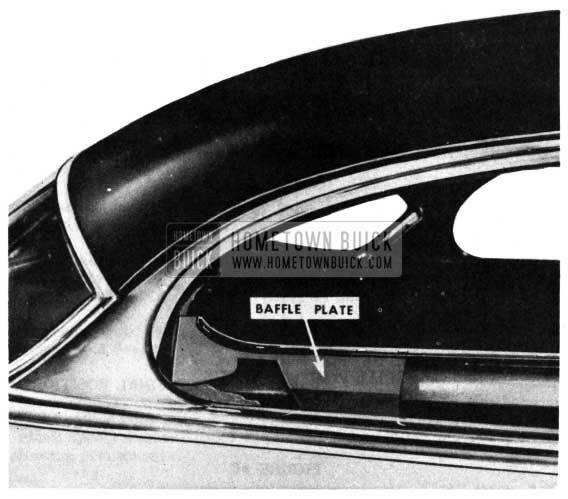 The following procedure should be used to eliminate rattles on 1950 Riviera Models which are caused by the upper frame of the ‘rear quarter window contacting the rear quarter side inner panel baffle plate when the window is in the lowered position. Lower the rear quarter window to the full open position. Remove the rear seat cushion and rear seat back assembly. 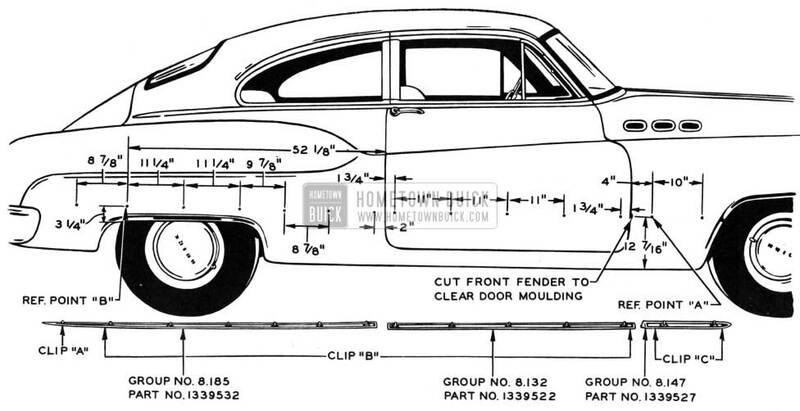 Remove the rear quarter molding and baffle assembly illustrated in Figure 94. Obtain a section of black convertible top material or a suitable substitute and cut a section the size and shape of the baffle plate. Cement the top material to outer face of the baffle plate with 3M Trim Cement as indicated in Figure 95. Next, bend the lower end of the baffle plate outward as indicated in Figure 96, so that it bears against the rear quarter window and will reduce the vibration of the window assembly. Reinstall the rear quarter finishing panel after the bending operation outlined in Step 6. Reinstall the seat cushion and back assembly. 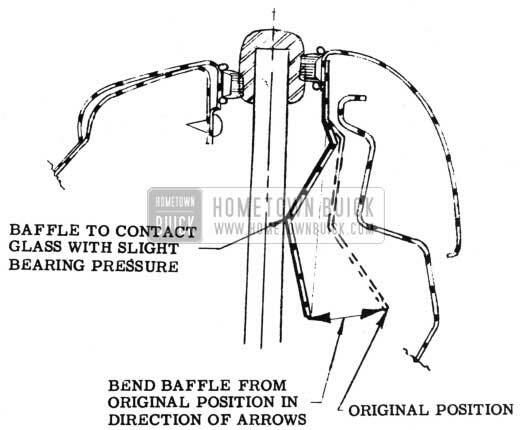 If a rattle should develop in the front door when the door glass is in the lowered position, on cars equipped with Hydro-Lectric systems, check to determine if the door window hydraulic lift cam assembly is contacting the hydraulic lift frame assembly support bracket as noted in Figure 97. Lower glass and remove door inside handles, moldings, arm rest, and trim pad. Using a piece of chalk, mark the location of the point of contact between the cam assembly and the support. Loosen the attaching nuts holding the door glass assembly to the cam assembly “C”. Raise the door glass assembly to an “up” position by hand. Holding the glass in this position, disengage and remove the cam assembly. Cut a notch in the cam assembly, indicated by the dotted line, to eliminate any contact with the support. 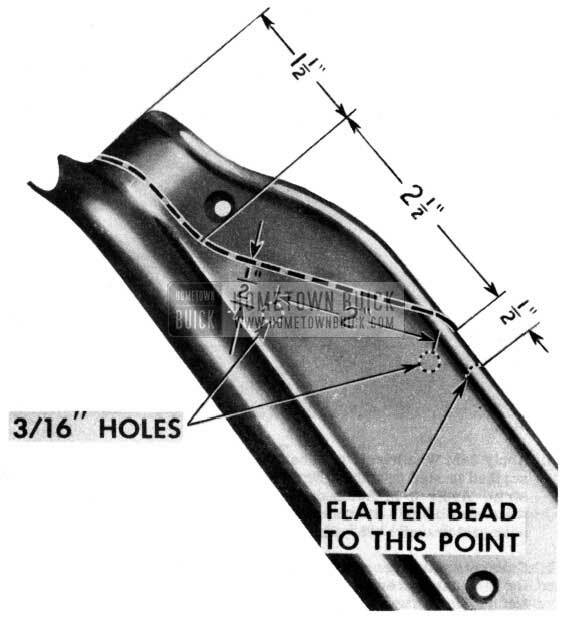 The notch should be approximately 1-1/2″ long and 1/4″ deep, as shown in Figure 97. Reinstall cam assembly, door glass assembly, loading hole cover plate, and door trim. Obtain a piece of sponge rubber approximately 3/16″ thick, 1/2″ wide, and 5″ long. Trim it as shown in Figure 98. The top surface of the sponge rubber to be used must have a continuous skin with no porosity. Remove the rear door sill plate. 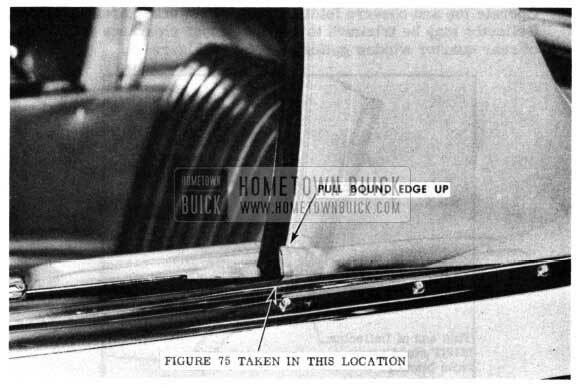 Swing the door to an almost closed position and from inside the 1950 Buick body determine where the sponge rubber spacer must be located on the center pillar in order to contact the door weatherstrip. In many cases9 it can be installed against the windhose as shown in Figure 99. Cement the sponge rubber spacer in place, as determined in Step No. 39 with 3M Weatherstrip Adhesive. Position the spacer with approximately 1” of the lower end under the forward end of the sill plate and the upper end on top of the hinge cover plate as shown in Figure 99. Seal along the full length on the underside of the sill plate with 3M Autobody Sealer and install the sill plate. Push-button type outside door locks used on all 1950 models have been changed in design to provide better protection against freezing. The new lock bas a swinging shutter in the lock cylinder and drain slots in the cap, sleeve and cylinder. This change in the lock cylinder results in the necessity for a key having longer grooves, which can be cut from Key Blank, Group 2.187, Part No. 3694624. The new long groove key can be used with the original ignition, dash compartment and trunk lid locks but the original key will not work with the freeze-resistant push-button door locks. The Lock Service Kit, Group 10.550, Part No. 3693969, as supplied by Buick Parts Warehouses, will contain only the improved type ring, washer, shaft and lock cylinder. U it is desired to change a first type 1950 lock to the freeze resistant type, a new cap and case, must be used in addition to the lock service kit. 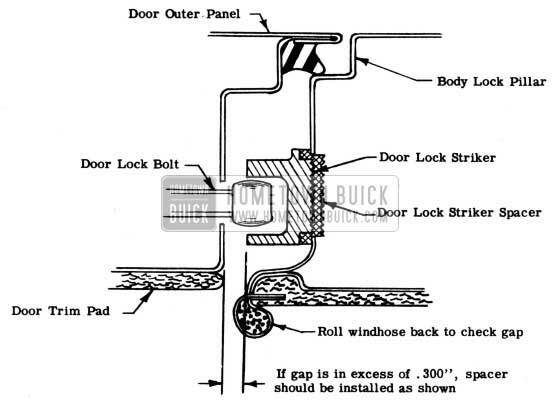 Full instructions for disassembly and assembly of either type lock are given on page 91 of the 1949 Abridged BPS. Instructions for setting up the lock cylinder to a special key number are included in each lock service kit. *Includes ring, washer, shaft and uncoded lock cylinder. The cylinder will not be supplied as a separate part. Close the door to a fully shut position. Carefully roll back the windhose and, using a suitable gage, check the spacing between the door lock striker and the door lock pillar. If the spacing exceeds .300″ (see Figure 100) a spacer and new striker screws should be installed as shown in Figure 101. We wish to emphasize that the longer (4587325) screws must be used whenever a spacer is installed under the striker. This is for safety reasons. At the start of 1950 production the Riviera and Convertible (56C-56R-76C-75R-76R) Front Door Ventilator Weatherstrips were retained to Front Door Ventilator Frames by five (5) rivets which were moulded in the weather strips. Recently the number of rivets was changed from five (5) to nine (9) and all rivets were relocated. Due to the non-interchangeability between weatherstrips using five (5) rivets and weatherstrips incorporating nine (9) rivets 9 the Parts Department will stock both 1st and 2nd type parts. Note that the part numbers for the Door Ventilator Assemblies and Ventilator Frames were not affected by the weatherstrip changes. Remove the center pillar trim assembly. Remove the check link strap to center pillar screw and remove check link strap. Make metal shims 1″ long and 1/4″ wide from 16 gauge sheet metal and install between check link strap and center pillar as required. 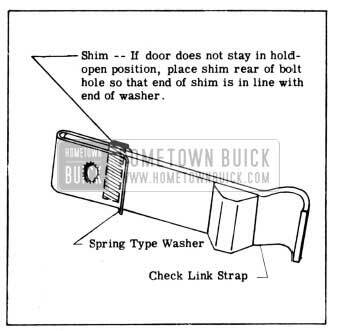 If door opens too hard or slams shut while being closed, install shim for­ ward of the bolt hole as shown in Figure 102. This will decrease the hold­ open pressure. 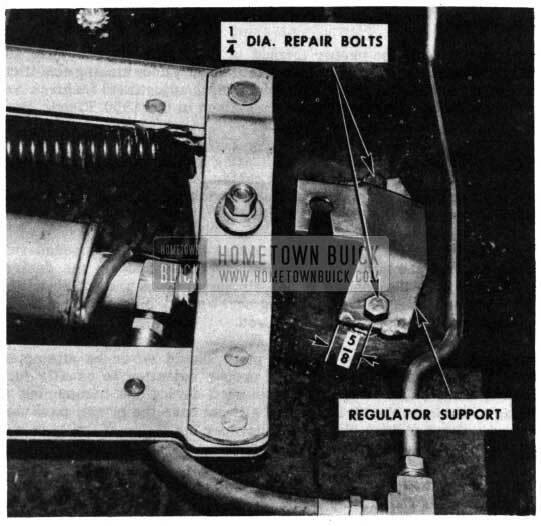 If door does not stay in the hold-open position, install shim to the rear of the bolt hole as shown in Figure 103. This will increase the hold-open pressure. NOTE: To hold shim in position while reinstalling check link strap, use 3M Weatherstrip Cement. After installation of shims check door operation, make any further adjustments required and reinstall center pillar trim. On present production bodies, the windshield and back glass are being sealed during installation with a neutral color rubber base sealer between the rubber channel and the body pinchweld. This new neutral color sealer is not available for service use, therefore, if it is necessary to disturb the seal between the rubber channel and the body pinchweld (when replacing the glass) the following windshield or back window sealing procedure should be used. After the channel is loosened from the 1950 Buick body pinchweld, the pinchweld should be cleaned with a putty knife or dry rags. The neutral color sealer does not have to be removed from the rubber channel and under NO circumstances should solvents (oleum spirits, gasoline, etc.) be used to attempt such cleaning as these solvents will soften and plasticize the rubber. Apply a bead of 3M Autobody Sealer along the pinchweld flange. 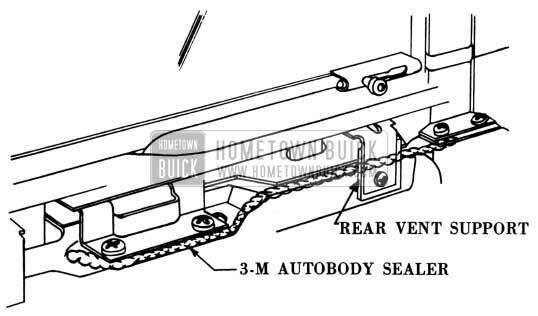 Install the glass and rubber channel to the 1950 Buick body. Apply another bead of 3M Autobody Sealer just under the outer lip of the rubber channel which contacts the 1950 Buick body. Cement the glass to the rubber channel with 3M Weatherstrip Adhesive clean up and complete the job. 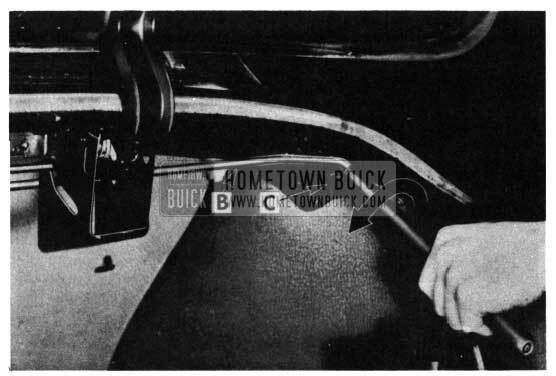 A few complaints have been received to the effect that rear seat cushion stops on 1950 models are located too far forward causing a gap between the seat cushion and seat back with one or more passengers on the seat. When this condition is en­ countered, the cushion should be removed and the stop locations checked by measuring the distance from the upper edge of the rise in the floor pan to the rear corners of the stops. This procedure is shown in Figures 104 & 105. If the dimensions vary only slightly from those given in Figures 104 & 105, correction can be made by bending the two (2) loops, located on the 3rd spring support wire on the bottom of the cushion, toward the front of the cushion. The loops should be bent a small amount at a time until the back of the cushion extends approximately 1 1/2” behind the lower front edge of the seat back. If the cushion is too far forward to allow adjustment in the manner de­ scribed, it will be necessary to cut the original cushion stops from the floor pan make two new stops and attach them to the floor pan in the correct locations. New stops can be made from two (2) pieces of 3/32″ x 1/2″ strap iron, or two (2) sections of 13 gauge sheet metal (.098″ thickness), 1/2″ wide and approximately 10″ long. Shape and drill the stops as shown in Figure 106 and then use the illustration, which is full size, as a template to check the accuracy of the stops. Cut the old cushion stops from the floor pan, leaving the legs welded to the pan. Measure from the rise in the floor pan, as shown in Figure 107, and make a chalk line across the pan in the correct location. 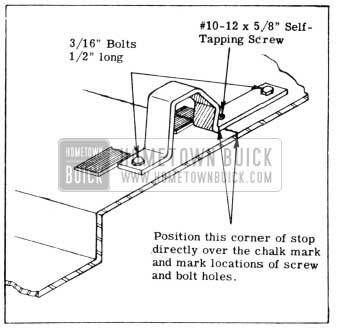 Place the new stops in correct position over the chalk lines, Figure 108, mark the location of the three (3) stop holes and drill the floor pan, using a 3/32″ drill for the screw hole and a 7/32″ drill for the bolt holes. Apply 3M Autobody Sealer around each hole. Install each of the stops to the floor pan 1 using one (1) size #10-12 x 5/8″ self -tapping screw and two (2) 3/16″ by 1/2″ long bolts, with a nut washer and each washer on the underside of the floor pan. CAUTION: Do not weld the stops to the floor pan as flying sparks may cause a fire or damage upholstery. When submitting AFA’s for water damaged insulation, involving partial replacement of the pad, the amount of material used should be shown in square feet (in the space provided for quantity) and clearly marked as such. If it is necessary to replace an entire pad, the correct part should be used in preference to the roll insulation and AFA’s submitted on a normal basis. 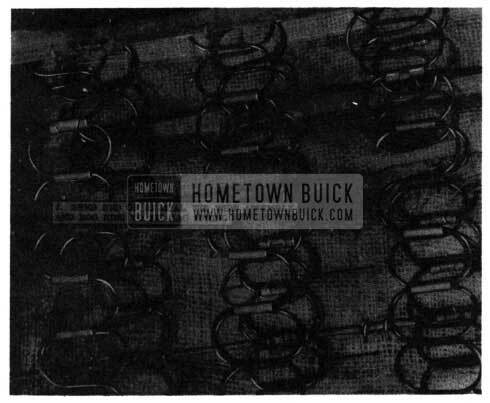 The cotton pad with tobacco cloth backing, which is placed over the rubber pads on Buick seat cushions, must be placed with the tobacco cloth next to the rubber pad. If the cotton pad is placed with the tobacco cloth toward the seat cushion cover, the cotton pad will have the tendency to roll and bunch on the rubber pad. Service men should be cautioned to make sure they place the tobacco cloth side of the cotton pad next to the rubber pad when building a seat cushion on models using this type of pad. Remove rear door sill plate. Rework the sill plate to the dimensions as shown in Figure 109. Obtain rear door sill plate weatherstrips #4592444 (right) and #4592445 (left). See Figure 110. Cement the “tabs” of the new Weatherstrip to the bottom surface of the sill plate, using 3M Weatherstrip Adhesive. 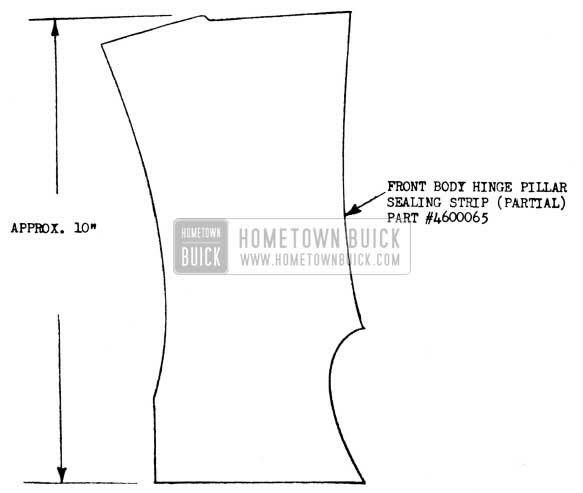 Hold the sill plate and the weatherstrip, which is cemented to it, in place on the rocker panel and scribe the location where the weather­ strip will contact the rocker panel. Lift off the sill plate and weather strip. Apply 3M Weatherstrip Adhesive to the rocker panel in the area scribed in step 51 and to the bottom surface of the rubber weatherstrip. Apply 3M Autobody Sealer along the underside of the sill plate, full length. Place a small ball of sealer in the forward screw hole (which is not used after trimming the sill plate). Carefully place the sill plate and weatherstrip in position and install the sill plate screws. Drill two pilot holes through the rocker panel for the new forward holes and install two screws similar to the other sill plate screws. 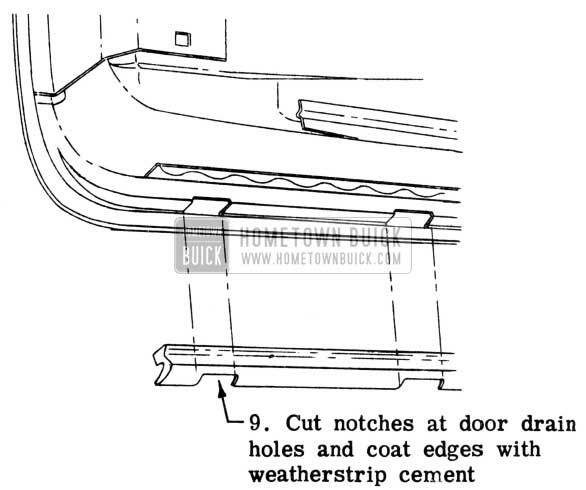 Cement the remainder of the weatherstrip to the center pillar along the inside edge as shown in Figure 111. Use 3M Weatherstrip Adhesive. Approximately January 10, 1950 Color Combination #06, Allendale Green, will be cancelled and replaced by Combination #14, Geneva Green. The new green is somewhat darker than Allendale Green and has slightly greater metallic content. Dante Red wheels will be optional, and will be specified by the numeral “1” immediately following the color combination number. The new Geneva Green will carry Duco No. 202-55565. Group 10.694, Part #4589111, Protector, Front Body Hinge Pillar Sealing Strip. The procedure for correctly locating the protectors is shown in Figures 113 and 114. The sealing strips are furnished in early and late designs, differing slightly in contour at the upper end. Both types are shown for your convenience. Use 3M Weather­ strip Adhesive for cementing purposes. Water stains on rubber floor mats used in 1950 Series 40 and 50 (front) jobs can usually be removed by washing the mat thoroughly with a soap or detergent, using a very stiff brush. Application of self -polishing linoleum wax will provide the mats with a more durable finish and a slight gloss. 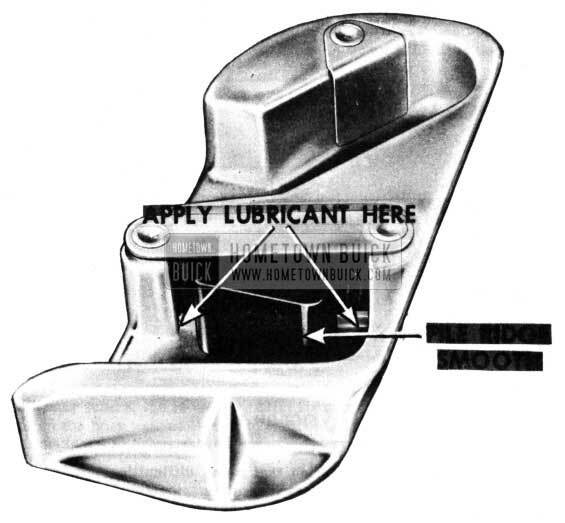 Apply a solution type graphite lubricant to the striker plate at the locations shown in Figure 115. If there is a ridge on the striker shoe, it should be filed off as noted. Color combination #24, Cloudmist Grey, Duco #260-55689, will supersede combination #05. Cloudmist Grey is a metallic color approximately the same shade as Sunmist Grey without the tan cast. Color combination #25, Kashmir Green, Duco #260-55688, will supersede combination #17. Kashmir Green is a metallic color somewhat lighter than Geneva Green and has a yellow cast. Both of the above new color combinations will carry the option of Dante Red wheel color. There will be no superseding two-tone green color combination. The folding top male hinge cover used on convertible models has now been discontinued in production. 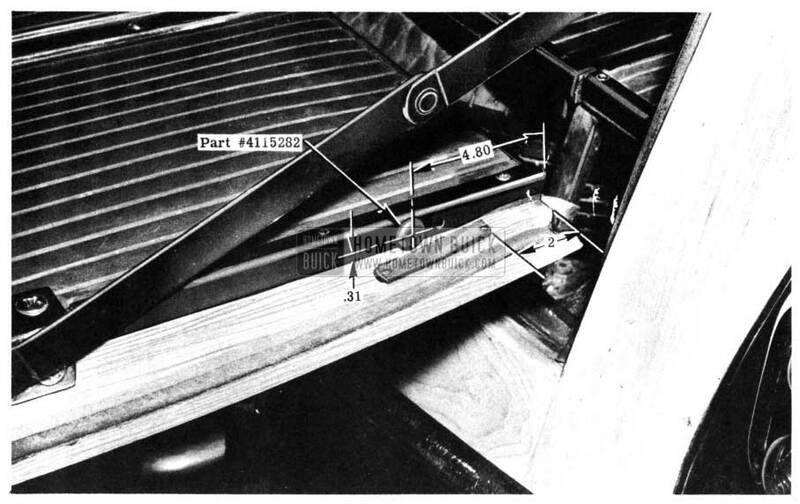 In the event that trouble is encountered on previous jobs due to top material being pinched between the cover and rear bow slat iron when in the lowered position, the cover should be removed and discarded (See Figure 116). This will prevent damage to the top. 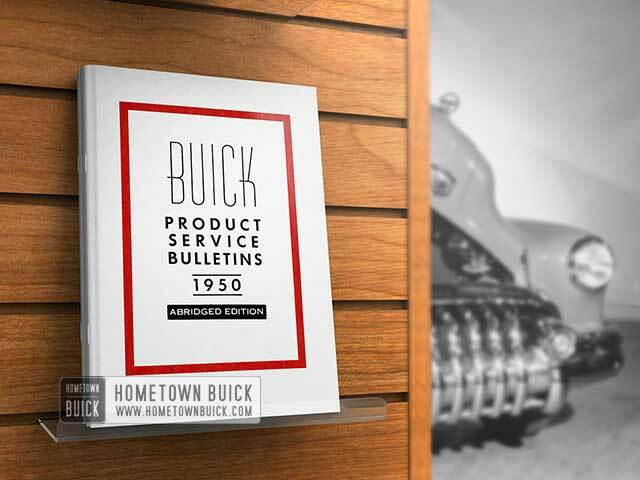 It has been called to our attention that some difficulties are being encountered on some cars which are directly attributable to the application of 1950 Buick body undercoating materials to these cars. While we have not, and do not intend to approve undercoating materials, we realize that undercoating will be done along as the public demands it, and as long as it is going to be done there are certain precautions that should be taken. The “carrier” or solvent used will, in many cases, attack rubber or neoprene. For this reason any parts under the car which are made of rubber or neoprene (such as the torque ball boot and brake hoses) should be carefully masked before undercoating is applied. It is also important to protect engine and Dynaflow units and any operating linkages such as clutch and brake and transmission controls before applying undercoating. Many dealers are still applying undercoating over the insulation under the hoods. This practice renders the insulation ineffective. Some dealers merely undercoat those portions of the hood not covered by insulation. Tests at the factory fail to prove that there is anything gained through this practice, and we feel it represents an unwarranted expense to the owner. A revision has been made in the paint formula for Cumberland Grey; requiring a change in the paint combination code to allow identification for service reasons. Old Code No. New Code No. Name New Paint No. *NOTE: There is no change in the Sunmist Grey color but it was necessary to change the Combination Code in order to identify the revised Cumberland Grey. Due to the unavailability of Rear Quarter Outer Panels for the 1940-50-70 models, the Parts Department has replaced these 1940 parts by the 1941 parts. When installing the 1941 Quarter Panels on 1940 cars it will be necessary to use the 1940 wheelhouse which is on the car. This is due to the fact that the 1940 wheelhouse was deeper than the 1941and if, the new wheelhouse is used, interference with the tire may result. In the near future, the loose hydraulic fittings and the female brass fittings on the hose assemblies of the Hydro-Lectric System will be changed from standard to heavy duty fittings. Open end wrenches of this size are available either individually or in standard kits made up by tool manufacturers. In view of the many complaints of limited rearward vision, through the inside rear view mirror on Models 51, 52, 71 and 72, a new 1/2″ longer mirror support has been made available for these models. We feel that the mirror should not be lowered more than 1/2″ because it will seriously affect forward vision through the windshield. A change has been made in the recommended method of removing excess sealing compound from plastic rear deck emblems. Our present recommendations are to remove the sealing compound with kerosene and then wipe the emblem dry with a clean, soft cloth. This change was made because of the danger that the alcohol formerly used would cause damage to the paint if accidently spilled.